Back in June, I wrote about how unfriendly Apple’s Iphone donation app policy was when I came across this editorial by Jake Shapiro, the CEO of PRX, (the company behind the popular This American Life iPhone and Public Radio Player apps), arguing that Apple’s policy of barring solicitation of donations by nonprofit groups is a cop-out and blocks a major revenue stream for public radio (and other nonprofits)—whose content enhances the value of Apple’s devices. His analysis looked at Apple’s flimsy excuses for their policy of prohibiting donations . He examines possible solutions to the problem – like in-app donations – which unfortunately would mean that Apple would take a 30% cut! Finally, he examines Apple’s lack of generosity as a failure of being a good corporate citizen. Jake suggests that given Apple’s hardball stance with tech partners, nonprofits and public media would have a slim chance of reversing the decision. In August, when PayPal added a donation feature that allowed users to make charitable contributions from within the services’s iPhone app, it appeared that Apple might have listened. Unfortunately, in late October, Apple made them pull the plug with no warning and little explanation. You can read about it in this post over at GizModo. I love my iPhone,but I don’t want to support a company that is so nonprofit unfriendly. Since none of these in-App donation challenges apply to the Android – as soon as my contract is up, I’m getting an Android. But, since I have a few more months on my contract, I’ve left a comment on this post asking Apple to reconsider its policy. If you think having the ability to make in-App donations through iPhones without hefty fees or hassle – please send Steve Jobs a message now by signing this online petition. The bottom line is really just understanding why they are taking this position – Considering the huge explosion of mobile donation via SMS it seems that Apple would understand the growing need. Just doesn’t stack up why they wouldn’t even explain. This bums me out too. There’s a lot of opportunity for stories to drive contributions in the same way we’ve done in web movies. Would like to know why it’s being blocked. and it would be nice if phone creators would help people do what they want rather than hinder it. FWIW I just got a new HTC myTouch 4G a few weeks ago and I absolutely love the phone! The gap between iOS and Android seems to me to be closing fast (if it’s not already closed completely)…hope I don’t set off a “religious” war here 🙂 iPhone is better at some things while Android is better at others. If you make the switch I think you probably won’t regret it. My recommendation is to focus on webapps and not on iPhone, Android, Win7, WebOS, Blackberry apps. If the webapp donation portal is created in HTML5, Apple, Google or any other company cannot be gate keepers and there are no fees. The argument can be made that we’re moving to an app driven internet, but I’m not convinced. 1. Why no charity pricing on hardware and software? 2. Why so little sponsorship of charitable events, with the rare exceptions being opportunities for heavy self-promotion? 3. Why no obvious corporate giving? Outside of the light educational discounts, the philanthropic arms of their major competitors (Microsoft, Google, even Facebook) are gigantic. 4. Why support censorship? What’s with policies that not only (selectively) ban risque content, but also ban political content? Or even content that you don’t appreciate, but your customers might, like the recent banning of the Android emagazine? Beth, you’ll find that your Android phone is different from the iPhone, but not in the ways that matter (great browsing, excellent email, plenty of apps). There will be plenty of cool things to replace what you might miss. One rider, though: switch to another carrier. AT&T’s selection is terrible and they cripple the devices more than anyone else. I’m very happy with T-Mobile. Apple’s stock value is the highest it’s ever been. By far. The reason companies do things is because of the profit they yield from said actions. Sometimes, being a “good corporate citizen” may help with branding and yield a higher profit. Sometimes it’s done for tax breaks. It’s never done for the hell of it. What is Apple’s incentive to do these things? Obviously their existing plan of attack is working quite well. @Allen — I’d half-debate that. While I’m clear that Microsoft uses their charity program in both promotional and manipulative ways, there’s a truly philanthropic justification behind it. Gates has certainly proved that he has a service ethic, as we do. I’m not looking for tech vendors to be unprofitable, nor do I think it would be good business on their part not to capitalize on the investment, like Salesforce does, making a lot of noise about their “1%” policy. But almost every major tech program has a charitable program, and some, like Microsoft’s and Cisco’s, stand out as being tied into corporate ethics. Others, like Symantec and Citrix have the pricing as a matter of due course — it’s expected. Apple hardly lifts a finger. If that isn’t impacting their bottom line, maybe we’re not making enough noise about it. This seriously has me re-thinking my iPhone and really considering moving to Droid. It’s a shame that Apply would not even match the efforts of other companies. Clearly, Apple does not care about community impact. Wow, thanks for that. Considering the number of social-changers I know who love their iPhones, I’m thinking they will reconsider if they realize what a poor CSR policy Apple has (That’s Corporate Social Responsibility, FYI). Good CSR is part of communicating to the public that you care not just about profits but about people and the planet. Come on, Apple. Great products, but where’s your integrity? Oh, and I was just thinking about buying an iPhone, too. Hunh. The possibility of having to leave out a call to action to donate is a tough situation for charities considering building an iPhone-specific app. One solution for developers who want to include donation options inside iPhone (iPad, iTouch) applications is to link outside the app to the mobile web. 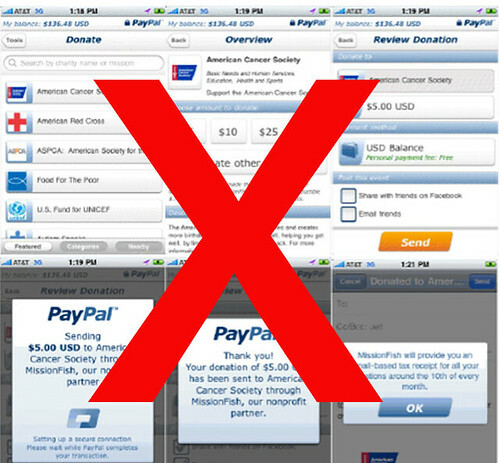 A secure mobile-optimized donation form works across devices & is not prohibited by Apple. I’d encourage developers who are working with charities in the mobile space to think about leveraging smartphone browsers by adding a “Donate” button (instead of tool) inside an iPhone app. At my day job I worked with Kids Help Phone (a Canadian youth counselling service) to create a fundraising app for their annual bowl-a-thon event. To get around the problems of having “in app” sponsorship of individual fundraisers, the developers just linked the personal “donate” button directly to a secure mobile web form. No matter what kind of iPhone app you are building you can always push out to the browser & access mobile web properties the charity might have, so this idea could be of use to developers working with NPOs. In all I agree with the commenters who are pro-mobile web! What’s to keep a shady company from pretending to be a nonprofit just so they can keep the 30% cut that they’d lose otherwise? Apple has an significant approval process for every application submitted to the app store. If a company was pretending to have 501c or equivalent status, Apple could investigate this as part of their process after the app’s submission. Right, but once those scam developers start spamming Apple with fraudulent “donation app” submissions — and you know they will — that’s going to be a LOT of 501c statuses to check. Don’t forget that cheaters will use any noble disguise they think they can get away with. It’s like phishing but with apps instead of emails. Besides, like you said, Apple doesn’t prevent using web pages for donations anyway. To get a simple online payment gateway with a credit card processor (like PayPal for instance) an org has to submit proof of status. I don’t think Apple would have major difficulty determining who qualifies for nonprofit status if they wanted to look at that. Apple can & will reject poor-quality or spammy app submissions for thousands of valid existing reasons & adding a qualifier for charitable status is, imo, a viable option for a company with deep resources like theirs. I think Peter Campbell said it very well above.No company is ‘pure’ and we can debate specific ways of being a good corporate citizen, but the obvious reality is that Apple simply doesn’t care to be in that debate…or to take corporate citizenship seriously. It’s not about iPhone apps; it’s a pervasive way of being in the world. To be fair, the Apple credo is straighforward techno-libertarianism–We make great products; great products change the world. If you don’t like our products, get other products. They’re not the only company with this credo. But they’re the most profitable and noteworthy. You know, back in the day, Apple was a great corporate citizen. They were pretty much the only game in town for supporting the nascent technology assistance movement in the mid 80’s-early 90’s. And they were going into the toilet financially. It wasn’t cause and effect, but when Jobs returned, he swept away everything and built everything anew. And, I think we’d all agree, built some pretty great stuff. Not that Steve takes advice from me, but there’s such an amazing opportunity for Apple to match its product creativity with social creativity. People *want* to *like* Apple, not just be held captive by its products.Apple could have it both ways. Oh well. I’ve got an iPhone, I love it, and I’m going to be shopping elsewhere when the contract expires, now that there are great alternatives. Thanks for starting this, Beth. I’ll just keep making donations via CFC every year ( http://www.opm.gov/cfc/ ) and not worry about what phone does what. I’m guessing that Apple is worried that they’ll get a black eye and get sued if some scammers fraudulently accept in-app donations. But, the same thing can happen online. Anyone can set up a website and accept “donations” even if they aren’t a real nonprofit. Nobody is suing web hosting services or web designers/developers for providing the web services. If anybody gets in trouble, it’s the person who paid for/runs the website. I think the same would be true of in-app donations. The people who develop/run the fraudulent app should be held responsible, not Apple. Is the issue the lack of revenue for Apple, or their concern over the legitimacy/accountability of non-profits, or that they don’t want to expose their brand to the threat of transactional fraud on their hardware? We’re just discussing an iphone app at the moment, which may overcome the latter two. But the first, no chance! Great post! I signed the petition and I don’t even own a smartphone (yet). Apple are all about style over ethical substance, both socially and environmentally (with albeit green improvements of late). Their draconian control over their architecture and branding is only surpassed by their arrogance across the Corporate Responsibility agenda. It is almost criminally saddening and frustrating that Apple wilfully avoid the potential for such a powerful brand to improve people’s lives and our planet. Imagine what could be achieved if Steve Jobs ‘donated’ one of his famous presentations or their design or marketing team to a good cause – similar to Pepsi ditching their Superbowl ad spend for their Refresh campaign. I signed your petition, and I’m happy to see that you’re almost at 1,000 signatures! Hope you get 5,000! Let’s face it, Apple has never been a good corporate citizen. When I worked fulltime at a nonprofit, people told me not to even bother contacting Apple for computer donations. Consequently, we got microsoft computers from Intel. Which worked just fine. Apple needs to learn that their selfish stance on helping nonprofits is going to hurt them more and more as people mistrust marketing messages and trust companies that show they are doing good in the world. I’m glad you made this petition. GO YOU! As one who contributed money to the development of Givabit, I’m SO disappointed that there aren’t LOTS of baby-simple ways for iPhone users to click and contribute to causes. I’m with you, Beth – thanks for standing up for what’s important and what’s right. Thanks for taking a lead on this, Beth. There’s a massive opportunity for Apple … and for giving … just waiting to happen. We had a similiar problem here in the UK with the Mobile Networks charging 20% – 30% of an SMS donation. A technical solution was found and simple regulations were implemented that ensured only valid registered charities could use the service, validation imformation being online, so the authorisation process can be both secure & automated. SMS Donations are now 100% fee free from the 2 largest networks & c95% from the other major networks. But we must keep asking! Thanks for starting this Beth! Here’s what I think – Apple is going into the Mobile Giving world… they want to ensure that they have cornered that market. Why provide a space for their competition on their platform. It’s not that Apple wants to regulate the sector, they want the lion’s share.